For most of my adult life, three questions determined my diet: is it easy, is it cheap, and is it low-fat. Cheap, easy and low-fat foods put most of our eating focus on pasta, rice, beans, and potatoes, and the super cheap chicken quarters from Sam’s Club ($0.29/lb at the time). I’d skin and separate them. Like many people, my weight crept up after marriage, so I put a lot of focus on the low-fat part of eating. Almost four years ago, I had a massive paradigm shift. My view of food was unhealthy and wrong. I realized that many of the staples in our pantry contained very little nutrition. But wasn’t the point of food to nourish our bodies? If we weren’t eating nutritious food, we were doing ourselves a great disservice. Though I had a strict grocery budget to follow, I knew that buying empty calories was bad budgeting. Food that nourishes is also food that satisfies. I’m not a food purist. Though I try to buy my meat, eggs, and milk locally, that isn’t always possible. I still have to keep within a budget, and that means making the best choices we can afford. It also means eating and fixing food my family will eat. We are not perfectly traditional, or perfectly paleo, or perfectly primal, or perfectly anything else. However, there are some foods we have eliminated completely. Some have been replaced by homemade options, others simply have no place in our current way of eating. Cereal. Whether it’s the “healthy” cereal intended for adults or the kids’ cereals, all cereal is highly processed grains. Except for a few, most also have added sugar. Yes, a few have fiber in them, but the fiber doesn’t add enough value to the diet to offset the problems that processed grains and sugar cause. Cereal has to be “fortified” because it lacks any natural nutrition. Granola bars. We all loved these, and granola is healthy, right? No, it suffers from the same problems as cereal: processed grains and added sugars. They don’t fill up kids or adults (and the glucose and insulin spike they cause will actually make you hungrier)! We do make homemade “granola bars” at home from rolled oats, peanut butter, chia seeds and a little bit of honey. It’s cheaper and the peanut butter brings some good protein to the table. The kids also know that these are a treat, no something to snack on anytime they want. Gummy snacks. Kudos to the marketing genius who convinced us that gummies shaped like fruit were a snack, instead of being candy like gummy bears. Yes, some are naturally flavored with fruit juice, and some have natural colors. They are sold with the snacks (right beside the granola bars). Let’s face it, though, they’re candy, and per ounce, expensive candy. They are also a choking hazard. We nearly lost the Engineer when he was two when he choked on a gummy snack. My training in infant and child first aid and CPR saved him (thank you, God). Instant oatmeal. This was a staple of mine for years. I love oatmeal–especially with sugar. I fell for the healthy image of oatmeal big time. Unfortunately, one little packet was hardly satisfying. I would be hungry again very soon. Additionally, the pre-packaged instant oatmeal is far more expensive than buying old-fashioned rolled oats or even steel-cut oats. Hot cocoa mix. You know how we’re always told to eat breakfast? In high school and college, I convinced myself that a big mug of hot cocoa could count as breakfast. Water, sugar, chocolate flavoring . . . not the type of thing to fuel a morning. Hot cocoa is a treat around here, but we try to get some good stuff into it by using our farm fresh milk, cocoa powder and sweetening with honey or maple syrup. (1 Tbsp each of cocoa powder and maple syrup per cup of milk, plus a bit of vanilla extract). Juice. I keep one bottle of juice in the house. It’s dark cherry juice, and it’s what the kids take their liquid cod liver oil in. The cherry juice is strong enough to help cover the fish taste; they get about 2 tablespoons a dose. Other than that, we don’t drink juice for the same reasons we don’t drink soda pop: it’s liquid sugar. It drives the appetite up, not down. Even pure 100% juice is missing the fiber and some of the nutrition found in whole fruit (and it simply doesn’t satisfy). Microwave popcorn. Our first dog was a huge mixed breed who loved children. He was the original chow hound. I’d seen him lick straight mustard off the floor and look for more. However, he wouldn’t touch microwave popcorn. Something about it said, “not food” to him. That raised alarm bells in me. I don’t know if it’s something on the popcorn or a material in the bag, butwe decided it would be better to avoid it. We pop in an air popper, season with salt and melted butter, so the popcorn is tastier and cheaper. Plus, our dog will actually clean it up if it spills. Chicken or beef broth. One of the first things I learned when I started studying traditional eating was how easy it is to make my own bone broth (stock). Instead of throwing away the chicken bones, I put them in the crock pot with lemon juice and lots of water, plus some vegetables. After cooking for 24-48 hours, the bones are soft enough to mush with my fingers. All their mineral goodness and collagen is in the stock, which can be frozen for later. It’s easy to make and “stock” up. Canned tomato soup. Do you feel nostalgic about tomato soup and grilled cheese sandwiches too? I forgo the sandwiches for just cheese these days, and I make my own tomato soup. It’s easy, quick, and has a nice, short ingredient list. Tomato sauce, broth, cream (or milk), and salt and seasonings to taste. I like mine with cayenne, but I skip that for the kids. Yes, tomato soup is cheap, but tomato sauce is cheaper, and I like knowing what’s in my food. Processed vegetable oils. This is the biggie. If you are looking for tips on what NOT to eat, this would be the top of my list. When I talk about processed vegetable oils, I don’t mean good quality olive oil or coconut oil. Those oils are actually quite good for you. I mean corn oil. Canola oil. Soybean oil. These oils require high heat and chemicals to extract them. The process denatures the oil and causes it to be rancid. To remove the foul color and rancid taste, the oil is further processed and bleached. The processed oil causes inflammation in the body. These oils aren’t just found in bottle in the baking aisle, either. Manufacturers use them in cereal, granola bars, and almost every other processed baked good out there, including many breads and crackers. These oils are cheap, so they get used in enormous amounts. Does my family eat perfectly? Not at all. We don’t avoid all sweets and treats, either. (We just had a birthday at our house–there was cake and ice cream.) These products are the ones that just aren’t worth it. 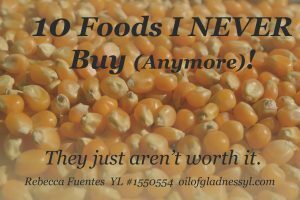 They aren’t worth paying money for no nutrition, or they aren’t worth the detrimental health effects. If we focus on whole foods that have nutrition in them, the question of, “What to eat?” becomes easier to answer.